WinQuire | Covering Microsoft products including Windows, Office, Server, Silverlight, Windows Phone, and a whole lot more! If you’re in love with Visual Studio as I am, you would probably prefer to do all of your coding day in and day out in Visual Studio. However, sometimes some languages may not appear as if they are supported in Visual Studio. One of those languages is C. Visual Studio is well known for its support of C++ projects, but doesn’t explicitly list C as a language. Because C++ contains all of the features/functionality of C, the VS C++ compiler will also compile any C code you write. To create a C project in Visual Studio you just need to create an empty C++ project and add any appropriate .c / .h files as needed. All will compile and work just fine. Here’s how you can start a new C project within Visual Studio. Note: This tutorial is designed/tested around Visual Studio 2012, the latest version of Visual Studio available as of this writing. However, this should work for any version of Visual Studio. Give an appropriate name to the project. The following steps walk you through creating the actual C files. The Add New Item dialog box should appear. That should be all you need to know to create a new C project in Visual Studio. If you have any questions, feel free to leave a comment below. It seems Microsoft is well aware of this issue and has issued a patch for Visual Studio 2012. It apparently has something to do with the Office 15 preview breaking your VS2012 install… you’d think Microsoft would have tested this and fixed it before release, but I guess not. I actually ran across this issue earlier today and figured it was a problem with the Visual Studio installer. After reinstalling, uninstalling, and installing again I eventually went and searched online for the issue. Thankfully, I was not the only one with this issue and I received the link mentioned above via a blog post at ACS Blogs. If you are experiencing this issue, the above patch should work for you. I just learned from Paul Thurrott that Microsoft announced some new services and products associated with its SkyDrive cloud service. Although most of the news was welcomed, one downside is Microsoft dropping the amount of free storage on SkyDrive from 25GB to 7GB. But, don’t fret yet, because Microsoft is allowing its loyal users (the ones who have been with them through thick and thin) a free upgrade to 25GB… for life. As far as I can tell, as long as you have previously created and used a SkyDrive account, you should be able to upgrade for free. Here’s how. Go to SkyDrive.com and sign in with your Live ID. Click the link to be presented with the option to upgrade to your 25GB of space for free, for life. Click “Free upgrade!”. 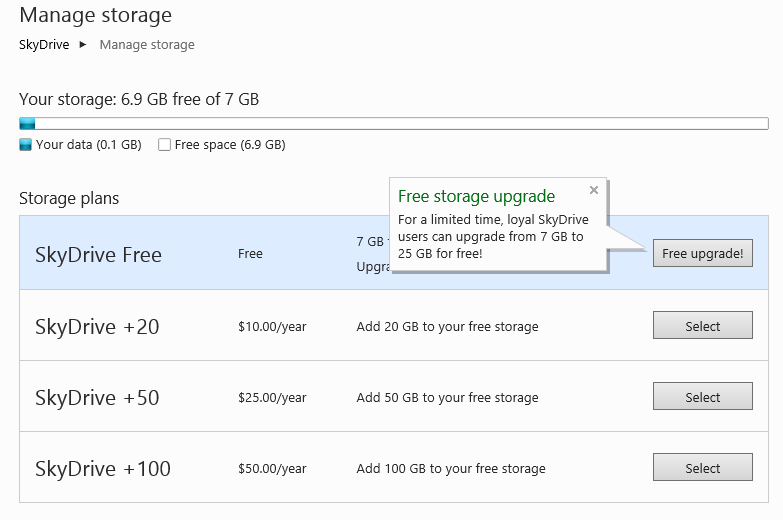 You now have free storage of 25GB for life on your SkyDrive account. Note, as you can see, Microsoft is now also offering paid-tier pricing plans. Up to 100GB per year, for an annual fee of $50.00. Along with this update, Microsoft has also released a SkyDrive desktop application that integrates with Windows Explorer. This is a very nice addition and one I plan on talking about soon. Microsoft today unveiled the Windows 8 Product Editions on their Windows Team Blog. There are a couple things we can take from this post. First, Microsoft is slimming down the product editions in Windows 8 and second, Windows 8 is now the official name for the next x86/x64 Windows (note, the importance of x86/x64 here, Windows RT is the official name for Windows on ARM, or WOA, devices). Windows 8. This is the base edition of Windows 8, similar to Windows 7 Home Premium. It will target consumers who need the basics, but don’t need the “enterprise” features that Windows 8 Pro offers. This edition supports upgrading from Windows 7 Starter, Home Basic, and Home Premium. Windows 8 Pro. This edition, which closely resembles Windows 7 Ultimate, targets power users. This edition includes every feature of Windows 8, with also power user features such as boot from VHD, Hyper-V, and BitLocker encryption, to name a few. This edition supports upgrading from Windows 7 Starter, Home Basic, Home Premium, Professional, and Ultimate. Windows RT. This edition only supports Windows on ARM or WOA devices. It is also the only edition to include Microsoft Office by default (however, this will probably be a slimmed down version of Office 15 and not the full version). Because Windows RT will only be installed on new WOA devices, most users will only need to worry about this edition when buying a Windows 8 tablet. Windows RT includes most, but not all, of the features in Windows 8. Users cannot upgrade from any version of Windows 7 to Windows RT. Windows 8 Enterprise. This edition is specifically for volume licensing customers, and as such, will not matter to consumers very much, if at all (though I’m sure some consumers could get into volume licensing if they wanted/needed to). This edition includes all of the features of Windows 8 Pro. This is a nice changeup from Microsoft. Users now only have two editions to choose from, which makes the buying decision a little easier, compared to Windows 7’s massive list of SKUs. If you have any questions about Windows 8, please do not hesitate to contact me. I’m currently trying out the latest Ubuntu pre-release, 12.04 (Precise Pangolin), and noticed Ubuntu removed support for Mono by default in this release. Prior to 12.04, Ubuntu included a default installation of the Mono Project. However, getting Mono back onto Ubuntu is very easy. Select Developer Tools from the left navigation pane in USC. Choose from one of the Mono/CLI developer tools installs and click Install (I recommend choosing complete Mono runtime, development tools, and all libraries). Enter in your administrative credentials if prompted and click Authenticate to continue. Done. Enjoy developing/running all your .NET applications. For those unfamiliar, the Mono Project allows applications targeting the Common Language Runtime (CLR, .NET applications) to run on multiple platforms, such as Mac OSX, *nix, and Solaris. The Mono Project also offers a free Integrated Development Environment for developers to use to develop their CLR applications on these different platforms. Overall, I’ve been very impressed with the project and it seems to be a huge success in the overall community. It currently supports up to .NET Framework 4.0 and is based on the ECMA/ISO standardizations of the CLR. The Mono project was a great addition to the software suite included in a default installation of Ubuntu. It allowed more scalability of the different types of applications which could run on Ubuntu, but further, it allowed users to test/run .NET applications in a Linux environment. I’m somewhat disappointed the team decided to remove this functionality, but at least they made it very easy to install. I may write up a separate post about developing and running .NET applications using the Mono project. 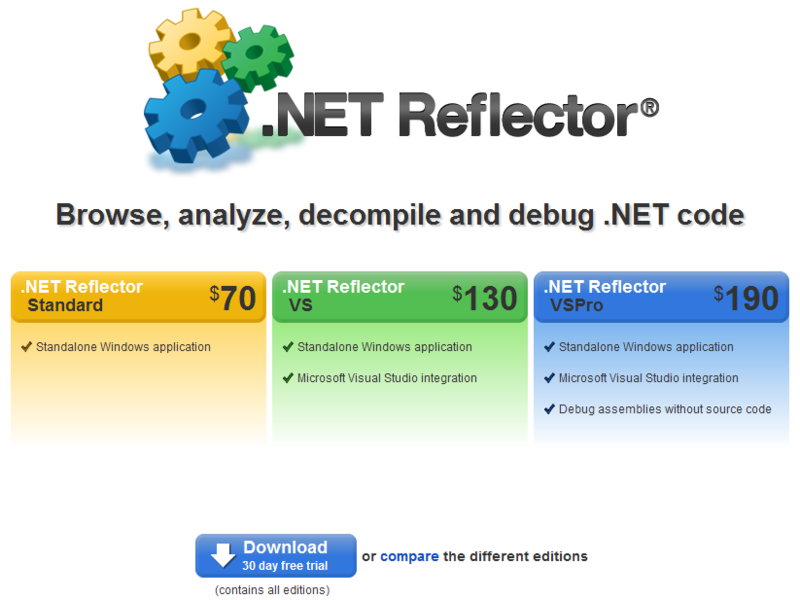 .NET Reflector’s Prices Have … Doubled? I tried finding the original prices using WayBackMachine … but it seems like RedGate offers dynamic pricing versus static pricing, so pricing didn’t even show up. If anyone has a screen capture of the original prices and would like to share, feel free to send it my way. BUT, I was able to find this, dating back to March 10, 2011 … Version 7 starting at $35. (Note: you can also see the Feb 2, 2011 announcement when they decided to switch Reflector over to a paid for product.) I’m not sure when RedGate put in the official price changes, as they have nothing on their site stating the increase, it just happened. This is quite a shame really, .NET Reflector was one of my favorite .NET decompilers. But for now, I will have to continue using my previous edition and have to deal with no VS integration, because there’s no way I’m spending $130 simply for VS integration. On another note, there are only two updates on RedGate’s “update” page. One shows the new release of Version 7 and the other announcement is the announcement that .NET Reflector is no longer free. That’s it. No announcement of future price increases, no other announcements on the future of Reflect, nada. I’m not against a price increase in general, I personally believe if you have a great product (which .NET Reflector is) you have every right to sell it, but doubling your prices instead of a slow increase, plus without notifying your customers, that I don’t like. I still don’t think this makes up for the drastic price increase. Hopefully, RedGate will change their minds about the price increases (or offer a lower priced edition), especially with other comparable free alternatives. When purchasing a new computer, or reinstalling Windows, one of the first things I do is change Internet Explorer’s default home page. By default, Microsoft sets the home page to MSN, which has had its fair share of security risks in the past. I always ask myself, why take the extra risk when I haven’t yet installed any other browser, or anti-virus, or possibly a firewall and go to a unsecure website from the get go. Instead, I opt to change the home page of IE before I even start IE. And, you can too … here’s how. First, before you open Internet Explorer for the first time, open up the Windows Start Menu / Start Screen and type internet options in the search box. Select the option Internet Options to display the dialogue box. 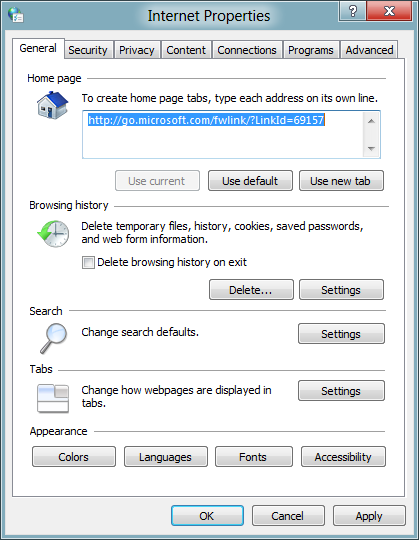 Note: If you are using Windows 8, you will still search internet options in the start screen, BUT, you must navigate to settings (on the right pane) and then click Internet Options. See the highlighted text? This will automatically point your browser to MSN.com (actually, it first directs to Microsoft.com, then forwards you to one of their MSN servers) … a potentially risky environment. Instead, I like to leave this option blank and instead navigate directly to the Microsoft Security Essentials download page. You could, of course, set IE’s home page to something like Google or another preferred search engine, but this also has had it’s issues with security in the past. To be safe, I opt to just leave it blank and navigate to the MSE download site manually. If for any reason you wish to go back to the original settings after you’ve installed your favorite security tools, just access this dialogue box again and click the Use default button. As always, have fun and be safe.